A whole independent genre of Chan literature evolved out of the practice of commenting on the gongan stories of past masters. Xuedou Chongxian compiled several collections of old gongan cases, attaching his own brief comments to each. These collections were called niangu (picking up the old [cases or masters]) when a prose commentary was attached and songgu (eulogizing the old [cases or masters]) when the commentary was in poetic form. The earliest extant Song version of Xuedou's records was printed in 1195, and can be found in the Sibu congkan xubian 四 部叢刊續編, vol. 29. They are given the title Xuedou siji 雪竇四集, which indicates that there are only four works of Xuedou in this collection. * The most popular version of Xuedou's discourse records is the Ming version, which includes six of Xuedou's works and now is included in the Taishō canon under the title Mingjue chanshi yulu 明覺禪師語錄. This collection does not include Xuedou's Verses on the Old Cases. The only complete collection of Xuedou's seven works is found in the Japanese Gosan 五山 version printed in 1289 and preserved in the Tōyō Bunko 東洋文庫 collection. The Gosan version has been republished in the series Zengaku tenseki sōkan 禅学典籍叢刊, vol. 2, under the title Secchō minkaku daishi goroku 雪竇明覚大師語録, which includes all seven of Xuedou's texts. *The four texts are Xuedou xianheshang mingjue dashi songgu ji 雪竇顯和尚明覺大師頌古集 , Xuedou heshang niangu 雪竇顯和尚拈古 , Xuedou heshang mingjue dashi puquan ji 雪竇和尚 明覺大師瀑泉集 , Qingyuanfu xuedou mingjue dashi zuying ji 慶元府雪竇明覺大師祖英集 . The Sibu congkan xubian was printed by Shanghai hanfenlou 上海涵芬 樓 in 1932. "The Yunmen line was greatly revived by the distinguished fourth generation master Xuedou Chongxian (d. 1052) and flourished over the succeeding generations, particularly through the school of Xuedou's successor 天衣義懷 Tianyi Yihuai (993-1064). It eventually died out when the last surviving master of the line did not find anyone he deemed capable of effectively receiving and transimitting the teaching. This event, which is recorded explicitly in Chan history, reflects the unwillingness of ancient Chan adepts in China to continue schools at the cost of reality, preferring to let a lineage die out rather than perpetuate empty forms. According to Japanese books, this tradition was not upheld so strictly in Japan, where there was far more proprietary interest in schools and sects, and even in China there are suggestions of faulty transmission in later times. In the fourth generation of Yunmen Zen House, another giant arose, the eminent Hsueh-tou, who was also a great writer and an outstanding poet. Traditionally regarded as the reviver of the House of Yun-men, Hsueh-tou is particularly famous as the author of the poetic commentaries on Zen stories of the classic collection Blue Cliff Record. Another collection of poetry is also attributed to Hsueh-tou, as well as an anthology of Zen stories with his own prose comments, the [瀑泉集 Puquan ji] Cascade Collection, selections of which are presented here to cap the section on Yunmen Zen. At that point, a monk came forward and bowed, whereupon Te-shan hit him. Hsueh-tou brought this up and commented, “Though the old masters Fa-yen and Yuan-ming skillfully trimmed the long and added to the short, gave up the heavy and went along with the light, this is not enough to see Te-shan. “Why? Te-shan was as if holding the authority outside the door; he had a sword that would not invite disorder even when he didn’t cut off when he should. Pai-chang called on Ma-tsu a second time and stood there, attentive. Ma-tsu stared at the whisk on the edge of his seat. Pai-chang picked up the whisk and held it up. Pai-chang hung the whisk back in its place. Ma-tsu then shouted, so loudly that Pai-chang was deaf for three days. Hsueh-tou brought this up and said, “Extraordinary, O Zen worthies! Nowadays, those who branch off in streams are very many, while those who search out the source are extremely few. Everyone says that Pai-chang was greatly enlightened at the shout, but is it really true or not? “Similar ideographs resemble each other and get mixed up, but clear-eyed people couldn’t be fooled one bit. When Ma-tsu said, ‘Later on, when you open your lips, what will you use to help people?’ Pai-chang held up the whisk—do you consider this to be like insects chewing wood, accidentally making a pattern, or is it breaking out of and crashing into a shell at the same time? Hsueh-tou brought this up and commented, “Everyone in the crowd says that Hsueh-feng didn’t go beyond this monk’s question, and that is why Chao-chou didn’t agree. If you understand literally in this way, you’ll deeply disappoint the ancients. Ts’ao-shu said, “A fine ‘not seeing people’s existence’!” And he hit him. Boston: Wisdom Publications, 2000. pp. 364-367. XUEDOU CHONGXIAN (980–1052) was a disciple of Zhimen Guangzuo. Xuedou came from Suining (near the modern city of Tongnan in Sichuan Province). Born into a prominent and wealthy family, the young man possessed extraordinary skills as a scholar. Determined to leave secular life and enter the Buddhist priesthood, he entered the Pu’an Monastery in Yizhou (near modern Chengdu City), where he studied the Buddhist scriptures under a teacher named Renxian. Xuedou was recognized as an adept in both Buddhist and non-Buddhist disciplines. After receiving ordination he traveled to ancient Fuzhou (near the modern city of Tianmen in Hubei Province), where he studied under Zhimen Guangzuo. After five years Xuedou received Zhimen’s seal as an heir of the Yunmen lineage. Xuedou later lived at the Lingyin Temple in Hangzhou and Cuifeng Temple in Suzhou before finally taking up residence on Mt. Xuedou (near modern Ningbo City in Zhejiang Province). 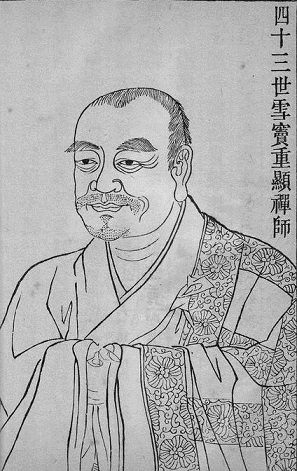 Xuedou compiled the hundred kōans that are the core of the Blue Cliff Record, the well-known Zen text later annotated by Zen master Yuanwu Keqin. Xuedou’s grand style of teaching rejuvenated the Yunmen lineage. The prominent Zen master Tianyi Yihuai was among his eighty-four disciples. Zhimen summoned Xuedou to come forward. Xuedou did so. Zhimen suddenly struck Xuedou in the mouth with his whisk. Xuedou began to speak but Zhimen hit him again. Xuedou suddenly experienced enlightenment. He first assumed the abbacy at Cuiyan. He later moved to Xuedou. He then used his hand to draw a picture in the air and said, “All of you follow this old mountain monk’s hand and see! Here are innumerable buddha lands appearing before you all at once. All of you look carefully. If you are on the river bank and still don’t know, don’t avoid moving mud and carrying water.” He then ascended the seat. Xuedou then got down from the seat and left the hall. A monk came forward and bowed. Xuedou then left the hall. The master then left the hall.